I thought I would draw your attention to this charming Meissen figure in Matthew Barton Ltd’s bi-annual auction at 25 Blythe Road. It was modelled, circa 1743, by the famous J. J. Kändler and would originally have been one of a pair on a chimney piece. One would be scratching and the other sitting upright, both looking at the other. It was at one stage in the noted Meissen collection of Sir Gawaine and Lady Baillie the remainder of which was sold by Sotheby’s last year. 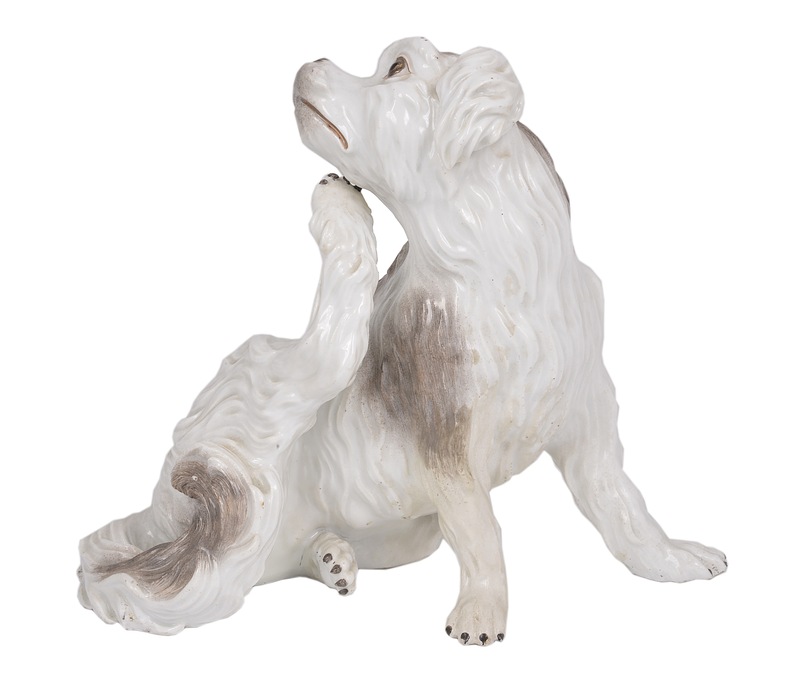 This entry was posted in Ceramics, Decorative Arts, Meissen, Porcelain, Uncategorized, Works of Art and tagged BOLOGNESE SPANIEL, ceramics, Decorative Arts, European Art, German porcelain, J. J. Kändler, Meissen, Sculpture.